BEIJING, China, July 4, 2011 (ENS) – The first trains on the new Beijing-Shanghai high-speed railway whizzed away on Thursday, with one train leaving Shanghai for Beijing and another traveling in the opposite direction. Fifty years ago, it would have taken two days for a one-way trip between the Chinese capital in the north and the eastern metropolis of Shanghai. Traveling at 300 kph (200 mph), the bullet trains covered the 1,318-kilometer (820 mile) distance between the two cities in under five hours. China is the first and only country to have commercial train service on conventional rail lines that can reach 380 kmh (240 mph). The Railway Ministry says they are holding the speed down to 300 kph to make the high-speed rail tickets more affordable. Calling it a “new chapter” in China’s railway history, Premier Wen Jiabao attended the opening ceremony in Beijing. Before the ceremony at the Beijing South Railway Station, Wen visited with passengers in the waiting room and listened to a report by the Ministry of Railways on the 38 month-long construction process and operation of the Beijing-Shanghai high-speed railway. Wen said the railway’s construction was an important decision by the state and of great significance to improve the country’s modern transportation system, promote the economic and social development, and satisfy people’s need for swift movement. Even though the Beijing-Shanghai high-speed railway has started operation, railway officials and managers still face the difficult task of ensuring operation is safe, orderly and efficient, the premier said. Wen stressed the importance of scientific planning, coordination of transportation systems and increasing the overall efficiency of the transport industry as China ushers in a new era of railway development. The Beijing-Shanghai High-Speed Railway is the first of eight high-speed railway corridors that China plans to build by 2015. “The Beijing-Shanghai High-Speed Railway is a national pride,” said He Huawu, chief engineer of the Ministry of Railways, who briefed nearly 300 foreign and Chinese reporters last week in Beijing before they embarked on a trial run. The trains’ Electric Multiple Units were developed and are manufactured by Chinese locomotive giants CSR and CNR, both state-owned enterprises. Zhao Guotang, chief engineer of the Beijing-Shanghai High-Speed Railway Co. Ltd. told reporters inspection and maintenance will be conducted for at least four hours on fixed facilities every night when trains are not running. Two test trains without passengers will be sent out from both directions every morning to confirm that the line is safe before it goes into regular operation for the day. New developments are springing up around the 24 stations along the Beijing-Shanghai High-speed Railway and China hopes the bullet train will bring investment and interest to the cities along the route. On June 20, seven cities, including Beijing, Nanjing, Shanghai and Jinan, established a tourism alliance to encourage travelers to use the new bullet train. 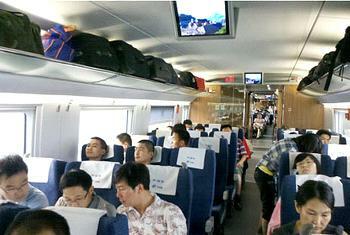 While the Beijing-Shanghai route is the longest high-speed run to date, the country does have other high-speed trains. 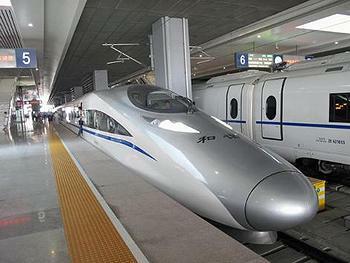 In December 2009, China opened a high-speed train link covering the 1,000 km between Wuhan and Guangzhou. The Beijing-Tianjin Intercity Railway opened in 2008, shortening the 117 km (73 mi) commute between the two largest cities in northern China to 30 minutes. Trains reach top speeds of 330 km/h (210 mph) and average 234 km/h (145 mph). The Shanghai Maglev Train, an airport rail link service, opened in 2004. It that travels 30 km (19 mi) in seven minutes, 20 seconds, averaging 240 km/h (150 mph) and reaching top speed of 431 km/h (268 mph). In October 2010, the Ministry of Railways declared the beginning of research and development on “super-speed” railway technology, which would increase the average speed of trains to over 500 kph (300 mph). China plans to have high-speed rail services running between 70 percent of its key cities by 2020, which would offer an alternative mode of transportation over more than 80 percent of China’s airline network.